Galerie Maria Lund – Paris 3, 48 rue de Turenne – 75003 Paris. Pipaluk Lake’s works of art offer the vision of magma in a continuous state of transformation, the image of the genesis of a world at the same time unknown and familiar, marvelous and scary. 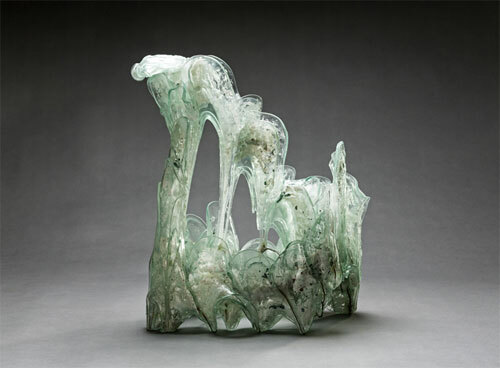 The works provoke numerous associations: strange flowers and imaginary growths, submarine creatures, heavy fleshes… textiles in the wind, nets emerging from the water, mountain streams rolling on stones, rocks, crystals, stalactites, stalagmites… These sculptures formed by stopped movements reverse the preconceived ideas on glass – its coldness, its rigidity. They manage to give a physical existence to visions and sensations that materialize themselves in our world for a brief moment. Here the imaginary confronts itself with elements, with matters and their rules. Pipaluk Lake’s sculptures invite to think with one’s hands, one’s eyes and to sense with the intellect. The letting go represents an important element in art: it is the moment where the artist forgets his or her intention, his or her will, to follow what presents itself in the process of creation and to be carried along like a “tool”. Pipaluk Lake falls within this register: she seeks to discover, to go beyond the limits of the known, of the “technically possible”. Thus, the title of her fourth exhibition at the Galerie Maria Lund – Planned accidents (Hasards planifiés) is also the description of her approach. The reason for the juxtaposition of these contradictory notions of planning and of accident resides in the fact that the work reaches for the expression and the materialization of contraries. Glass has the identity of a precious matter – a bit glitzy – but Pipaluk Lake uses banal plate glass, sometimes even recycled window glass as well as simple metal threads and metallic plates to create her sculptures. It is an aesthetic that questions the idea of beauty and ugliness; that places on the same level the sophisticated and the rough, the noble and the poor matters. Fragility and density cohabit there, as well as a luminous sheerness and matte opacity; a same work of art can recall elements and bodies as different as the wind or the rock. A medium for a sensorial and emotional experience, Pipaluk Lake’s work also prompts an intellectual questioning: the vision of her works raises the question of their creation, which process is narrated by the matter itself. One reads in it the more or less visible meeting of the glass, made fluid by the heat, with the metal that structures, orients and supports. Pipaluk Lake’s sculptures, rich in evocations, are poetries of the advent, of movement as well as a distinct permanence (of beauty). The artist takes a long time to conceive her glass and metal “bundles”; she cuts, hammers, attaches, knits, sews… Putting into practice a know-how acquired during a quadruple training in fields as diverse as textile, glass, metal and wood. Once her complex preparation work finished, she abandons her “bundle” to the alchemy of heat and gravity inside the kiln. By opening it during the firing she can see at which stage the process is and decide to continue our to stop it. The result of the fusion offers a more or less big surprise, a result with which the artist works further on. The very atypical work of Pipaluk Lake (born in 1962) has been largely recognized and rewarded (Hempel Glaspris 1999 – Honorable Mention at the 2nd Chongju Int. Crafts Competition 2001, Korea – Silver Medal for the Kunsthåndværkerprisen af 1879) and it is featured in numerous public collections : V&A, London, Corning Museum of Glass, State of New York- Glasmuseum Alter Hof Herding, Germany – Boston Museum of Fine Arts – Kunstindustrimuseet (Museum of Decorative Arts), Copenhagen – The Danish Arts Foundation and the New Carlsberg Foundation. Pipaluk Lake has exhibited throughout Europe as well as in China, Korea, Canada, the United States and recently in Australia. In 2006, The Chappell Gallery in New York featured her in a solo show (Drops), in 2011 the museum Glasmuseet (Denmark) hosted an exhibition of her recent works (awarded by The Danish Arts Foundation) and in 2012 the public institution Sophienholm (Denmark) presented a retrospective exhibition of the artist – Pipaluk Lake 1987-2012. Hasards planifiés – Planned accidents is Pipaluk Lake’s fourth exhibition at the GALERIE MARIA LUND since 2008. Publishing of a retrospective catalog, with a text by philosopher Yves Michaud (Exploration, Fragility, Beauty – until the limits of the material). This edition was supported by The Danish Arts Foundation.